I ported the particles demo program in JavaCL to Processing 2.0 alpha. It has reasonable performance in my iMac up to 500,000 particles at twenty something frames per second. The video is captured using the QuickTime screen recording. The performance is much slower than the original screen version. Here is the OpenCL source. The existing OpenGL codes for Processing do not work in the 2.0 alpha. Here is an example code segment I modify to use the new PGL class. The are two major OpenCL libraries for Processing at the time I do the testing, MSAOpenCL using the JavaCL and openclp5 using the JOCL. I do not use the Processing libraries and call directly the Java binding codes. Each of the implementation contains a Hello World example kernel that performs calculation across a large array. In my test, I modify the kernel program to do a multiplication between two floating point numbers with an array size of a million cells. I use a MacBook Pro for the testing. The operating system is OSX Lion. It includes the OpenCL implementation in the default OS. The graphics card is Nvidia GeForce 9400M with 256M graphic memory. The Processing version is alpha build 2.0a5 running in 64-bit mode. Various JAR files have to be copied to the code folder. Here is the summary. I did ten consecutive runs of each implementation. The final figure is an average of the ten runs. Each measurement is taken just before and after the kernel execution. The first implementation (JOCL) has more fluctuated results. The second implementation has only a single command to invoke the kernel execution and passing back the result. Therefore, it is not easy to single out the execution time of the GPU. The third implementation (JavaCL) is obviously the fastest one and more stable in terms of parallel execution. This is the second test of the Neurosky MindWave brain sensor in Processing. I use the fluid simulation library diewald_fluid with the GLGraphics rendering library, to display the alpha, beta, gamma and theta wave components. The new Kinect for Windows is available and will be available in Hong Kong in late May according to the blog description. The commercial SDK is also out now for download. 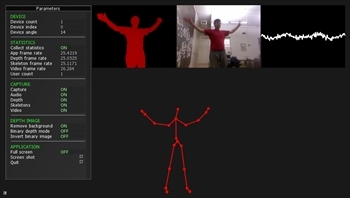 TouchDesigner has a set of new operators for the Kinect for Windows. They are quite easy to integrate with the existing TouchDesigner working environment. University of Central Florida Interactive Systems and User Experience Lab has also released a Unity3D plugin with the new Kinect SDK. There are also a number of openFrameworks addons for the Kinect for Windows, ofxMSKinect and ofxKinectNui. For library Cinder, here is the Kinect SDK Block. For Flash ActionScript users, the AIRKinect can be a good choice. At the time of writing, I am still waiting for the Java binding and thus the Processing community. I try to work out another version of the DirectShow for Processing classes in the last post. In this version, I write the movie data directly to an OpenGL texture object. Below is the modified version of the DMovie class. The DCapture class can also be modified in the same way. I adopt the DirectShow Java Wrapper to work in Processing with two classes, one for movie playback and one for video capture. At this moment, there are just two Java classes, not an individual library yet. Since it is for DirectShow, it is of course in Windows platform. You have to package the dsj.jar and the dsj.dll (32bit or 64bit according to your platform) into your code folder. I try out different video playback mechanism in the Processing to compare their performance. The digital video is the one I used in the last post. It is the trailer of the film Hugo. The details are: 1280 x 692 H.264 AAC, bitrate 2,093. The computer I am using is iMac 3.06 GHz Intel Core 2 Duo, 4 GB RAM, ATI Radeon HD 4670 256 MB graphic card. Processing is the latest 1.5.1 version. For the video playback classes, I tested the default QuickTime Video library, a FasterMovie class, the GSVideo library, and the JMCVideo library with JavaFX 1.2 SDK. To render the video, I start with the standard image() function, and proceed to test with various OpenGL texturing methods, including the GLGraphics library. Again, I sample the CPU and Memory usage with the Activity Monitor from the Mac OSX utilities, in an interval of 30 seconds. The results are the average of 5 samples. The second batch of tests use the standard OpenGL vertex and texture functions. The third batch of tests involve custom arrangement in OpenGL. Both GSVideo and JMCVideo come with their own functions to write directly to OpenGL texture. For the FasterMovie test, I combine it with the pixel buffer object I have shown in my previous post. I have done a simple performance comparison with a number of video playback methods in OSX. It gives me some ideas about which development platforms, namely the OpenFrameworks and Library Cinder to work on with high quality video playback. The test is straight forward, and as the same time, not very rigorous. VLC and Real Player are used as benchmark for comparison. The OpenFrameworks and Cinder programs are the standard QuickTime video player samples in the distributions. I use the trailer for the film Hugo in 720 HD. The exact dimension is 1280 x 692 H.264 AAC and bitrate at 2,093. The figures are average of 5 samples taken at an interval of 30 seconds.